A new barrier and gate system is being introduced at the Kent Live Expo taking place this week in Detling. The SOSEC solar powered system is claimed to be the first such unmanned system to be available in the UK and could solve some pressing security issues in the construction industry as well as increase its sustainability profile. 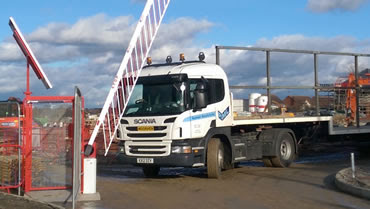 With a need for vehicular access control to keep construction compounds secure, the industry is heavily reliant on manpower or powered gates linked to fuel-burning generators or mains power, something which isn’t readily available at many building sites. The solar powered gate promises to overcome both of these problems whilst providing the secure access control that’s needed. The technology stems from the increasing availability of static access control systems that rely on the sun as their source of power. The gate manufacturer has adapted the technology to make it suit the needs of mobile systems, which need to be light and easly transported and constructed. The SOSEC gate is on display in the Low Carbon Zone of the event in Kent.